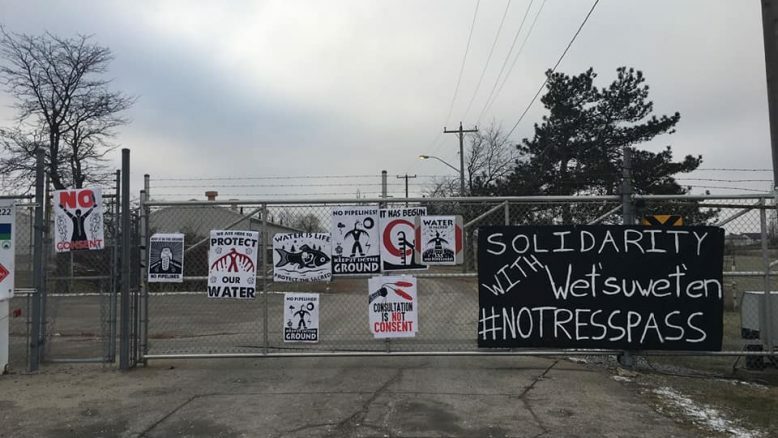 As of approximately 9am on Monday January 14th, a group entered & shut down a TransCanada (Now TC-Energy) facility in what is Dish with One Spoon Territory, known as Hamilton, ON. The group taking actions acknowledges itself as a mostly-settler and white-passing group; one that sees silence and inaction in these moments as complicity, and who see their responsibility as settlers to challenge and dismantle the harmful systems their ancestors have enacted. They also want to remind our allies and comrades that compliance under duress is not consent. As allies, settlers, or visitors we don’t get to pass judgement on the decisions of hereditary chiefs because we like to think or pretend that we would do otherwise; we only get to decide what our response will be. Will we bare silent witness and allow it to happen? Or will we direct our anger and grief towards those responsible, and help shut this project down? The state happens to think we’ll do the former: that we’re not highly functional. And we’re not, so long as we’re enacting our displaced disappointment onto those facing down armed violence. But we say otherwise: shut it all down. You want something to happen – get out there and make it happen. We’ve had the roads, the ports, the highways. Today we have the infrastructure. What tomorrow is, only you know.